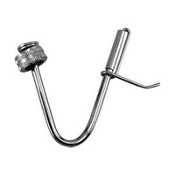 Stainless steel bottle washer hooks up to sink to spray inside of bottles and carboys. Fits garden hose or wash basin sink. Requires adapter to fit kitchen sink.